Women are as different as the bodies they live in. When considering implants, some women want to look natural, and some have other expectations. No matter what your body size, type or what look you are going for, your breast implants can be tailored to give you the exact look you desire. No matter what the reasons are for your implants, you can be sure they will help you feel more feminine and confident about your body. Just keep in mind you are doing this for yourself, and not anybody else. This is your body, so you might as well have it the way you want it! So let’s first define the differences between ‘natural look’ and ‘fake look’ as it pertains to your Scottsdale breast augmentation. Natural looking breasts have the advantage of looking much like what mother nature intends a breast to look like. Many people won’t be able to tell just by looking at you that you have had some work done. Your scars will be almost non-existent, and the enlargement will compliment your figure in a very natural way. When going after a natural looking breast augmentation, your surgeon will be enhancing your existing breast, and not trying to build a whole new look for you. Most natural-looking breast implants are placed under the chest muscle, and the size will be proportionate to the rest of your body. ‘Fake look’ breast augmentation has been made popular by Hollywood celebrities, and many women seek this look in order to achieve a very specific look. 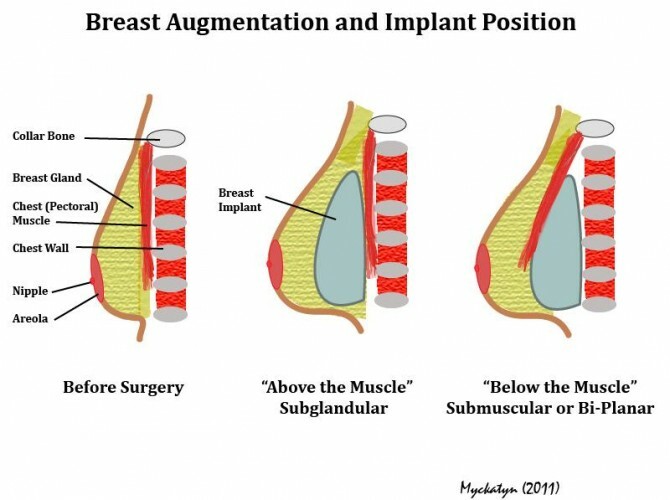 Characteristics of fake-looking implants include a higher positioning on the chest, a pronounced rounded shape that gives a permanent push-up-bra sort of effect, and an unnaturally large size in proportion to the rest of the body. Fake-look implants are placed over the muscle, and have a higher profile, meaning they will protrude more from the chest wall, compared to the natural look. There may also be prominent contouring and rippling around the edges of the implant. The breasts will look much closer to the ‘end result’ than the natural look directly after your surgery, and often the recovery time is much quicker. When making your decision about what sort of implants are right for you, you may have the opportunity to ‘try on’ some sizes (samples) in order to get an idea of how they will look post-surgery. Whatever you decide, it is important to consider lifestyle issues that may effect your tolerance; for example, women who practice yoga, run, jog or participate in some sports may be at greater risk for complications if choosing larger sized or fake-looking implants. Ultimately though, it is up to you. Ask a lot of questions, and tell your doctor everything you can about who you are and what you are expecting from your Phoenix Breast Implants . Take some time to consider what you really want, and speak with Dr. Rochlin to find out what is possible. Dr. Semone Rochlin is one of the only female cosmetic surgeons in the Scottsdale, Phoenix and Gilbert, Arizona, area. On a mission to make women look and feel their very best through breast augmentation and various other shape and visage enhancing procedures, she is trusted by women throughout Arizona, who depend on her for beautiful, life changing results through breast implants and more. Call today for a free consultation.